We love Saffi, the main character in LOOK OUT, It’s a Dragon!, unlike other dragons she’s extremely kindhearted and friendly. But dragons don’t have the best of reputations so complications arise when she tries to make friends. 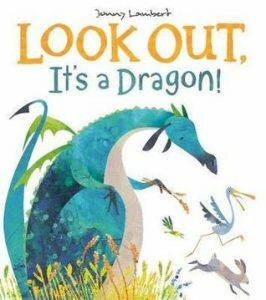 The Story: When Saffi the dragon looks for a new home she lands in the woods but the woodland animals don’t give her a very warm welcome. Saffi tries to befriend them but her attempts backfire so she leaves. However, when other dragons put the animals in danger Saffi comes to their rescue and helps them find a housing solution that will suit them all. LOOK OUT, It’s a Dragon! is a beautifully illustrated story about overcoming prejudice, accepting differences and friendship. Mouse and the other birds and animals have preconceived ideas about dragons and Saffi’s efforts to dispel them inadvertently lead to more trouble. Saffi’s chance to prove that she’s different comes when other dragons behave as the woodland animals expect them to but despite the way that Saffi has been treated she rushes to the aid of her new friends. The danger of stereotyping and judging others is dealt with in a gentle and humorous way. Saffi is such an innocent, lovable character and we really empathise with the joys and disappointments that she experiences in the story, the double spread where she leaves really pulls at our heartstrings! The simple text is easy to read and is accompanied by Jonny Lambert’s beautiful, earthy illustrations. Saffi is a beautiful blue green colour and the animals, including birds, a fox and a squirrel are gorgeous. Mouse, the smallest character, proves to be the most vocal, we love it when he squeaks ‘Knobbly knickers!’ and at one point he bellows! This story is fantastic for initiating discussion about how first impressions can sometimes be wrong and that getting to know somebody before making a judgement is important. There are lots of other talking points that can arise from this story including making friends, treating people as you expect to be treated yourself, the habitats of different creatures and which animals live in a wood. What a lovely storybook. It’s fab that the storyline shows that everybody is different and that is OK. A nice message to get across to our little ones. It’s a gorgeous book and Saffi is a really loveable main character. I like the way that the message is subtle and not didactic. Oh this sounds fab and I love the illustration on the cover. I really love it when books for children have a message like this one. We love the fact that Saffi is such a lovely character, dragons are often portrayed very negatively! It’s especially funny as it’s a mouse that says ‘knobbly knickers’! Saffi the dragon is a fabulous role model! !